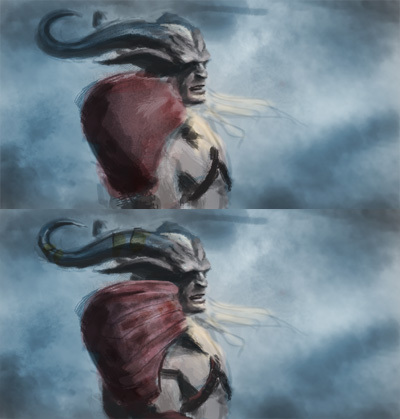 Dragon age 2 digital painting tutorial. 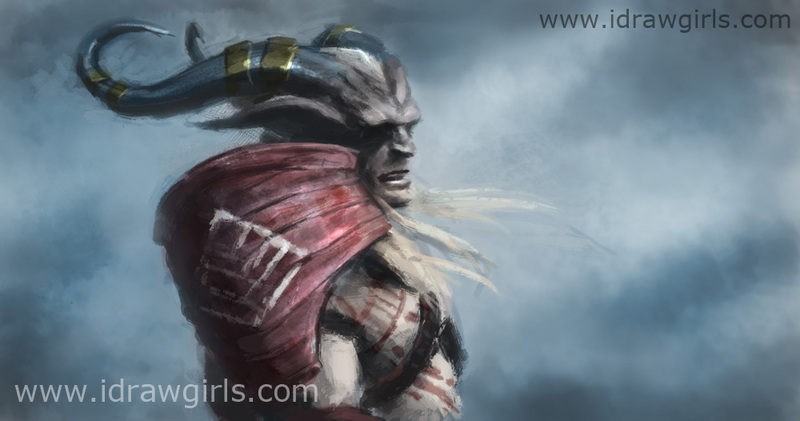 This video tutorial will show you how to paint Qunari Arishok from Dragon Age. This Dragon Age 2 Digital painting tutorial have video and step by step images for you to learn from. You can scroll down further to see step by step images with instruction. This is another short painting study from cinematic screenshots from Dragon Age 2. I wan stunned by how great and realistic the lighting in the cinematic is. One of the best cinematic I’ve seen nowadays. It is the bright day light in Dragon Age 2 cinematic that attract me the most. I have not painted in that kind of setting much. I will often choose the darker mood like at dawn or dusk because it is easier for me to create the lighting in that setting. So I particularly pick Dragon Age 2 cinematic to practice with so that I would learn more painting in bright light setting. Lighting (value) is by far one of the most difficult subject for any artists, no matter how long you’ve been painting. And it is one of the most important or the most important element in painting because without light, there will be nothing to paint. I have to admit that it is very fun doing a lot of study, I don’t really have to think much. I just observe, learn and analyze. Practice with repetition is a very strange thing, there is no word that can describe how you can learn with just doing it over and over. Memorization and repetition have been, for many years, considered very poor learning techniques, yet the old truth and value with rote learning is now coming back with increased recognition that learning by repetition. It is an essential part of good study practice. There is no way to take advantage of “repetition” without repeating. The multiplication tables, touch typing, piano playing, Kung Fu and many other subjects have long depended on repetition. Now it is become clear that there are important roles for repetition to play in the learning of ANY subject. Painting is also one of these things, you can not paint by just understanding it without practice. I have never seen one good painter who did not practice by repetition. Past research shows that repetition results in increased learning. However, it is not clear whether repetition adds more information to memory, or allows the learner to use a more sophisticated method of encoding. Anyway, trying to figure that out is beyond me, I am just an artist. 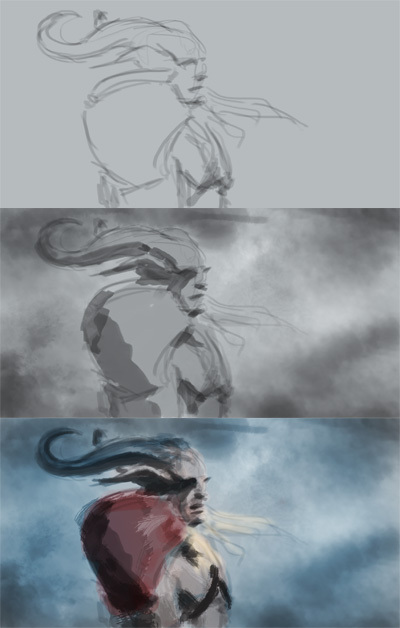 Below are step by step how to draw and paint Dragon Age 2. Step one, I just sketched out a rough shape of Qunari’s head, his shoulder pad and upper torso. Step two, I just painted basic shadow shape on his head, horns and body. Step three, I then apply color on his head and figure, also trying not to alter any value or light and shadow that is already in there. You would actually call this stage blocking in color and value. Here are more steps of painting process. Step four, I refine his facial feature using the existing color and value. Remember to keep it simple, little value goes a long way. Step five, I then keep refining the rest of the body. You have all the brushses along with the premium tuts, but it is not the point. It is all about knowing where to place value and play with edges. For tablet setting, I use default setting most of the time. Don’t worry so much about that, very minor stuff. Just make sure your pen is pressure sensitive, that is all there is to it,. What brush did you use to sketch? is it included in the brush package? (i’ve bought 2 tutorials, didnt notice it) would like to know becuase it looks really nice.